Many years ago we lived in the suburb of Bryndwr and regularly visited Chopsticks a Chinese restaurant specialising in Chinese and Malaysian style food. It was always very popular and arrived just as more traditional ethnic foods were starting to become popular. Mall on the corner of Ilam & Clyde Road. It’s in the same group of shops as Five Stars Vietnamese. Although they never used to have much in the way of vegetarian options, we figured after all this time it might be worth a revisit. 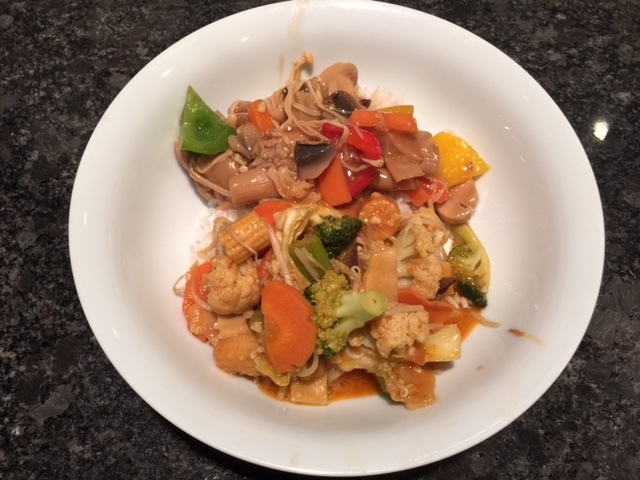 However, they still don’t have a lot of items listed under the vegetarian section on their takeaway menu – 6 items in total including two items with Oyster sauce. Oyster = shellfish and therefore animal, so off the menu for vegetarians… unfortunately fairly common on many Asian restaurant menus. Of interest though is that they do have a number of items clearly marked as Gluten Free on their menu so if that is your issue, it might be a good choice. We ordered ahead by phone and picked the Mixed Vegetables with Satay Sauce (Spicy) and Fried Mixed Mushrooms – total was $31 including steamed rice. The Fried Mixed Mushrooms was a mix of various Asian style mushrooms. I can’t give you the names as I don’t know but I thought this was the better of the two dishes. I love mushrooms so this may have skewed my opinion. This is in the top half of the bowl in the photo. Mixed Vegetables with Satay Sauce was more a thai curry style consistency, and not particularly spicy. It was sweet though. My partner thought this was the best of the two dishes. Our verdict was it was “OK” – nothing exceptional. In terms of the serving size, it did two for dinner. There was very little leftovers, no rice and only a couple of spoonfuls left of each dish. We used these up on a “clear out the fridge” meal on Friday night. Would we come back here again? Not in a hurry. There are not enough vegetarian choices and nothing that we’d rush back for. Would we order the same dishes again? We might not have much option as really only two other choices other than vegetarian fried rice or noodles. Would we try something else? As above, that could be tricky unless we got very creative with their menu. Tofu with Lemongrass perhaps? Would we recommend Yummy? Not for vegetarians – there are much better options. Is it better than Welcome Vegetarian Cafe (our baseline restaurant)? Not by a long shot.